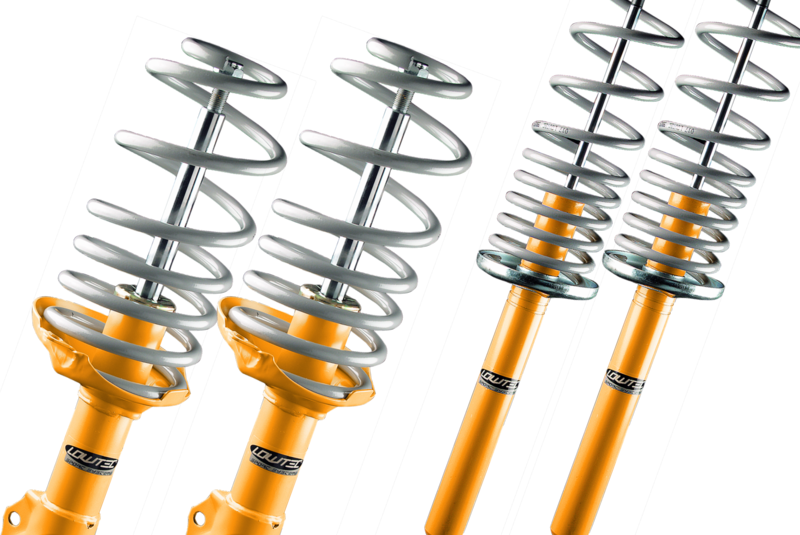 Suspension Kit normally consist of 4 damping adjustable shock absorbers and 4 progressively wound lowering springs. They look like the stock items in terms of size etc and are a direct replacement. 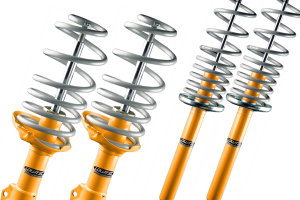 Our Suspension Kits normally consist of 4 damping adjustable shock absorbers and 4 progressively wound lowering springs. They look like the stock items in terms of size etc and are a direct replacement. Suspension Kits are carefully tested and matched for each individual car to guarantee you the best possible performance. Suspension Kits deliver an approximate lowering of 40mm, giving your car the self-conscious, sporty appearance you are looking for. At the same time the kit gives you unrivalled, razor edge handling and performance. Your car will react to your steering better than ever, while dynamic vehicle roll is considerably reduced. Most of the dampers are externally adjustable to allow even further customisation to your individual needs! Damping is easily adjusted with numerous settings available. Set the car up how you like, hard or soft you decide! I want to be able to adjust the ride and the height in my suspension kit..
What is a Coil over Suspension? 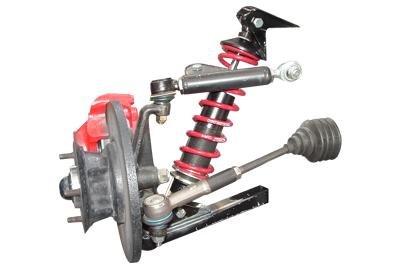 A coil over is a performance height adjustable suspension kit system that can be used on a road or track car. overs will lower your car from 30mm on the highest setting to just over 90mm on the lowest setting. Adjusting the ride height is easily done via an adjustable platform mounted on the body of the shock absorber. Height adjustment can easily be adjusted ‘on car’ by simply jacking the car up, taking the weight off the suspension strut then winding the collar up to higher the vehicle, or down to lower the vehicle. Measuring each corner with a tape measure ensures you have the same ride height front to back. There are infinite levels of adjustment, so creating the perfect stance is easy. The damping level has been increased by approximately 25-30% which reduces body-roll but has been kept to a satisfactory level so as not to spoil the ride quality of the car. The ride will be firmer but not too hard. We cover a massive range of vehicles and the experience to go with it so just contact us for any help you might need.